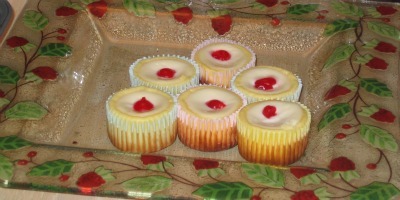 With Mini Cheesecake Recipes you are sure to find a perfect dessert for your next party. Delicious and easy to prepare, they have the full flavor of cream cheese cheesecake made in individual servings. Be sure to have plenty on hand as they will be the first to disappear from your dessert table. Any of these recipes can be made ahead. Just cover and chill until party time. Easy Mini Cheesecake Recipe can be mixed and ready for the oven in just minutes. Mini Chocolate Cheesecakes will satisfy your sweet tooth with their rich chocolate flavor. Mini Oreo Cookie Cheesecake is an Oreo cookie and cheesecake lover’s delight.